Ahmed’s guitar band Amanar takes their name from the constellation Orion; by virtue of an old story, one of many about a great Tamashek warrior by the same name. As the story goes, Amanar, an grand and imposing figure, accidentally bumped into a woman milking her goats to feed her children, and the bowl overturned, spilling the milk into the sand. The warrior grabbed a handful of desert and squeezed, wringing the milk back into the bowl. The mother was satisfied as was Amanar, but the earth was furious. It promised the warrior, “When you die and your body is buried, I’ll squeeze you twice as hard for eternity!” The sky however took pity on the warrior who could never be buried in the ground, but as a consolation placed his body in exile amongst the stars. Tuareg guitar, for the uninitiated, falls somewhere between the Berber guitar of North Africa and the pentatonic rhythms of Ali Farka Touré — invoking the now cliche image of the musician, guitar slung over shoulder and Kalashnikov in hand. Not that the picture is entirely false, though nearly always misrepresented and deformed into something else, plucked out of the desert and broadcast on the Colbert Report, appealing to a common myth of rebel chic. The foundation of the music however is rebellion, the style was formed and refined in Libyan camps of exiled Tuaregs, and the content of the music has never strayed far from these origins — lyrics that invoke struggle and suffering or outright appeals and calls to arms. It’s particularly poignant now, as another rebellion has ignited in the North with a force not seen since 1990. The same songs that have been circulating for the past twenty years in concerts in Bamako, marriages in Kidal, or in bedrooms of Tamashek ishumar from Algeria to Niger, are again speaking with a renewed fury. Amanar is Kidal’s town band. But Kidal is empty, turned battleground. The group has scattered, some in the desert around Kidal, others in Algeria. 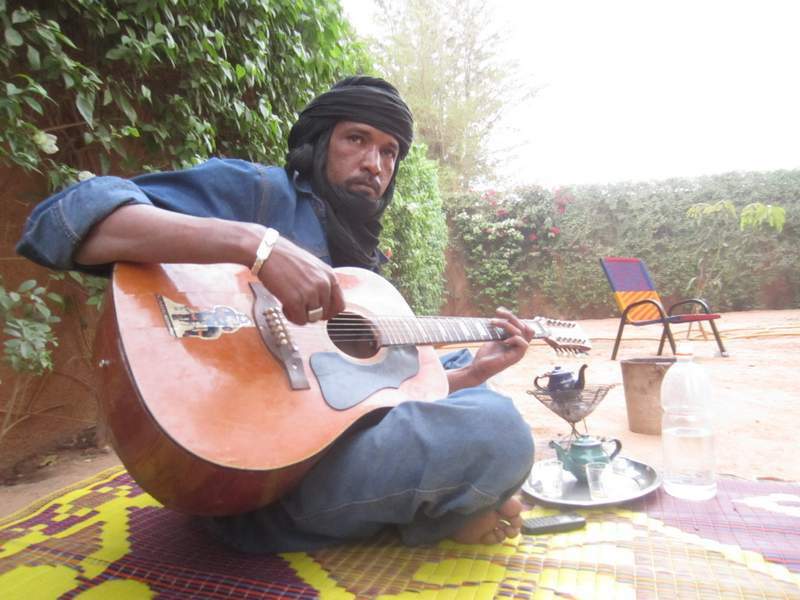 Ahmed, the band leader and soloist is in the capital of neighboring Niger. One morning that surprised us in pain. Every where I look, I see our people running away. The battle continues to rage, and the confusion of the rebellion has made it impossible to return home for the moment. Ahmed says he will continue to work, that now is the time to speak. It’s fitting perhaps, that like Amanar the warrior, it’s in exile that their message will be heard. Welcome to the Desert Kingdom.